WELCOME TO GRAND STRAND ADVERTISING! Advertising is a marketing communication that employs an openly sponsored, non-personal message to promote or sell a product, service or idea. Sponsors of advertising are typically businesses wishing to promote their products or services. Advertising is differentiated from public relations in that an advertiser pays for and has control over the message. It differs from personal selling in that the message is non-personal, i.e., not directed to a particular individual. Advertising is communicated through various mass media, including traditional media such as newspapers, magazines, television, radio, outdoor advertising or direct mail; and new media such as search results, blogs, social media, websites or text messages. The actual presentation of the message in a medium is referred to as an advertisement, or "ad" for short. Worldwide spending on advertising in 2015 amounted to an estimated $529.43 billion. Advertising's projected distribution for 2017 was 40.4% on TV, 33.3% on digital, 9% on newspapers, 6.9% on magazines, 5.8% on outdoor and 4.3% on radio. Above as shown on Wikipedia. No Grand Strand Area Firm Owns The Grand Strand Related Social Media Channels & Websites That We Do! We own and run (thru our principal owner, Joey O'Connor) over 200 Grand Strand Related Social Media Channels (including our 100+ Facebook Accounts) and we own over 50 Grand Strand Related Websites - all to help get your establishment or service be seen and promoted! We have 25,000+ combined followers on all of our social media accounts and we have 3,000+ pages on our websites to run your advertisement on!... We also have 100's of categories in multiple online directories that you can sponsor! And, you can add a full-page company profile that will show "forever - for life" on many of our websites and networks! Our clients receive the ability to get help with Social Media Management, Search Engine Optimization, Website Design, General Advertising, Public Relations, Brand Management, Logo Design, Photography, Audio & Video Production, and More! Our clients also receive Free Questions & Answers by email or phone call or sometimes in person... Have a question about Facebook? Have a question about your current website that someone else did for you? Have a general business question or just need someone to go over part of your business plan with?... Our clients receive this free! We want to help your business - it's what we do! Our cients also receive the ability to submit unlimited news, jobs, and events that get distributed over to any and all of our sites that would pertain to your content! Your content also gets posted on your company profile page with us! Our clients also receive the ability to use our 'press release distribution' service where your news can also be distributed to 100's of local/regional media contacts. Our clients also receive the ability to have a 3 hour business consultation! 2 hour initial metting to review your current business plan and discuss any improvements, changes, etc. Then, after a few months, receive a 1 hour follow-up meeting! HOW TO WORK WITH US! ----- SIGN-UP! It's Simple.. Become A Client! Our clients, and only our clients, are able to take advantage of all of our advertising avenues and services! » » Sign-Up today and, in doing so, we start advertising your company right away by adding a full-page company profile and listing your company on multiple sites, networks, and business directories! And, we broadcast the news of your company being added with us on our social media where 1,000's will see your profile/company in just the first 24/48 hours alone and then you will be found FOREVER on all of the sites, networks, and business categories! Already A Client? Companies and professional individuals that have already been added with us on any of our network sites, and are showing on our main client list, can advertise with us and take advantage of all of our Advertising Avenues and any of our other services! Don't remember if you are already one of our clients or not? Not a problem at all! Just visit our Clients & Listings page to see if your company is on it! What's New For Us In 2019? - We will be partnering with local organizations, local chambers, associations, as well as local print publications, local tv and radio channels, and yes, even other advertising firms - to be able to offer you ALL OF THE ADVERTISING OPTIONS that are available on the grand strand! - We are proud to announce that starting in March we will be donating 10% of our Gross Earnings to local charities, schools, organizations, associations, and churches! - We put 10% of our Gross Earnings to local advertising! ConwaySC.net purchased for an un-disclosed amount! Site is up and live! AynorBusinessDirectory.com purchased for an un-disclosed amount! Official Launch Coming 2nd Quarter 2019 - if not sooner! GrandStrandHotelDirectory.com, GrandStrandRestaurantDirectory.com, and GrandStrandGolfDirectory.com purchased for an un-disclosed amount! All are part of the GrandStrandBusiness.com network. CompaniesAtTheBeach.com purchased for an un-disclosed amount! Site Is Up & Live Now! | part of the BusinessAtTheBeach.com network. SeafoodAtTheBeach.com purchased for an un-disclosed amount! Site Is Up & Live Now! | part of the BusinessAtTheBeach.com network. WatersportsAtTheBeach.com purchased for an un-disclosed amount! Site Is Up & Live Now! | part of the BusinessAtTheBeach.com network. DiscoverGardenCity.com purchased for an un-disclosed amount! Official Launch Coming 1st Quarter 2019 - if not sooner! Holy Cow Batman! GrandStrandBusiness.com purchased for an un-disclosed amount! Site Is Up & Live Now but will officially launch in January '19! Will become my main network for all of my Grand Strand area websites and networks! And, a great compliment to GrandStrandBusinessDirectory.com. FoodTrucksAtTheBeach.com purchased for an un-disclosed amount! Site Is Up & Live Now! | part of the BusinessAtTheBeach.com network. MyrtleBeachRestaurantDirectory.com purchased for an un-disclosed amount! Will be officially launching 4th quarter 2018. VenuesAtTheBeach.com purchased for an un-disclosed amount! Site Is Up & Live Now! | part of the BusinessAtTheBeach.com network. AttractionsAtTheBeach.com purchased for an un-disclosed amount! Site Is Up & Live Now! | part of the BusinessAtTheBeach.com network. ServicesAtTheBeach.com purchased for an un-disclosed amount! Site Is Up & Live Now! | part of the BusinessAtTheBeach.com network. FishingAtTheBeach.com purchased for an un-disclosed amount! Site Is Up & Live Now! | part of the BusinessAtTheBeach.com network. StoresAtTheBeach.com purchased for an un-disclosed amount! Site Is Up & Live Now! | part of the BusinessAtTheBeach.com network. SalonsAtTheBeach.com purchased for an un-disclosed amount! Site Is Up & Live Now! | part of the BusinessAtTheBeach.com network. RealtorsAtTheBeach.com purchased for an un-disclosed amount! | part of the BusinessAtTheBeach.com network. ChurchesAtTheBeach.com purchased for an un-disclosed amount! Site Is Up & Live Now! | part of the BusinessAtTheBeach.com network. ConwayVIP.com purchased for an un-disclosed amount! Official Launch Coming January 2018!.... Become a member today! For individuals and businesses! We have just been approved and accepted into the Shopify Partners Program! Need help with your current Shopify account or need to set-up a new Shopify account? Just let us know! DiscoverMurrellsInlet.com purchased for an un-disclosed amount! Official Launch Coming 1st Quarter 2018 - if not sooner! DiscoverNorthMyrtleBeach.com purchased for an un-disclosed amount! Official Launch Coming 3rd quarter 2017! ConwayBusinessDirectory.com purchased for an un-disclosed amount! This will become a great addition to ConwayLiving.com , ConwayCareers.com, and DiscoverConway.com! Already Officially Launched And Live! GrandStrandBusinessDirectory.com purchased for an un-disclosed amount! This will become a great addition to HorryCountyDirectory.com and GeorgetownCountyDirectory.com! Official Launch Coming 12/15/16! MyrtleBeachGolfDirectory.com purchased for an un-disclosed amount! This will become a great addition to GolfCoursesAtTheBeach.com , GolfClubBusiness.com, and OnTheGrandStrand.com! Official launch coming January 2017! CarolinaCoastalMedia.com purchased for an un-disclosed amount! This will become the new Media Division of Joey O'Connor Enterprises! SouthCarolinaBusinessRegistry.com purchased for an un-disclosed amount! Official Launch Coming 4th quarter 2016! We are proud to announce that we are now an official member of the Conway Chamber of Commerce! GeorgetownCountyDirectory.com purchased for an un-disclosed amount! Official Launch Coming in June! It will be a fantastic addition, and compliment, to the OnTheGrandStrand.com network! HorryCountyDirectory.com purchased for an un-disclosed amount! Official Launch Coming in April! It will be a fantastic addition, and compliment, to the OnTheGrandStrand.com network! EatAtTheBeach.com purchased for an un-disclosed amount! Official Launch Coming in April! It's our 9th 'At The Beach' site and will be a great addition to the BusinessAtTheBeach.com network! ConwayCareers.com purchased for an un-disclosed amount! Official Launch Coming Soon! It will be a great addition to ConwayLiving.com and the BusinessAtTheBeach.com and OnTheGrandStrand.com networks! MyrtleBeachEmployment.com purchased for an un-disclosed amount! Official Launch Coming Soon! Joey has updated his Photography page with more information on his photography services as well as details on how to purchase many of his photos! Joey has some exciting new additions to his Music Page! ConwayLiving.com purchased for an un-disclosed amount! Official Launch Coming Soon! It will be a great addition to the BusinessAtTheBeach.com and the OnTheGrandStrand.com networks! Joey O'Connor has moved to the Grand Strand Area - Conway, South Carolina to be exact! Anyone in the area, or vacationing to the area give Joey a shout! BarsAtTheBeach.com purchased for an un-disclosed amount! Official Launch Coming in February! 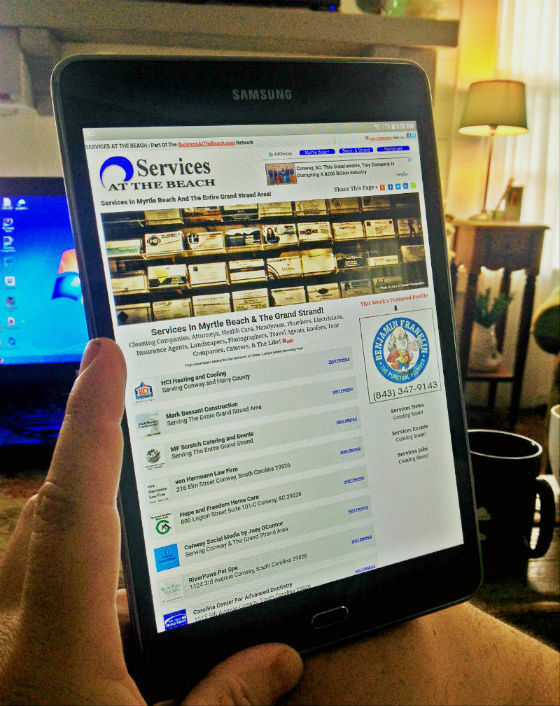 It's our 8th 'At The Beach' site and will be a great addition to the BusinessAtTheBeach.com network! Some exciting things to come in 2015 for Joey O'Connor Enterprises! Stay tuned for an important announcement! HotelsAtTheBeach.com purchased for an un-disclosed amount! Official launch coming August 2014! Most of our main publications are now iPhone friendly! OnTheGrandStrand.com is up and live with an official launch date of January '14! The online publication to match up with DirectoryMyrtleBeach.com and JobsinMyrtleBeach.com! DirectoryMyrtleBeach.com is up and live with an official launch date of January '14! Check it out! Over 130 Categories! JobsInMyrtleBeach.com purchased for an un-disclosed amount. Already up and live! After a 20+ year hiatus from the music industry, Joey is back writing and playing music! Check out his new music page! OUR SOCIAL MEDIA FACEBOOK PAGES!